In Startups are Risk Bundles, Leo Polovets outlines the risks startups face as they grow. In particular, Leo identifies common mistakes when addressing that parcel of peril. Addressing minor risk by spending time and effort on low priority or low impact risk a common failure mode for companies. The business isn’t focused on the most critical issues. One founder I met recently took this idea to heart. On the last slide of his presentation, he listed the four key existence risks facing the business today. In the adjacent column, he wrote the strategies he intends to employ to mitigate those risks. Hiring risk: Building the team in a mercenary job market. Product market scale risk: Does the current product address the needs of the broader market and not just customers? Customer success risk: Will the initial customers renew and expand? Fundraising risk: is the company on track to attain the milestones for series A investment? Those are just some of the critical risks facing an early stage software company. This list is my creation, not from the founder’s deck. Another tactic would be to list the key risk for each department for the next quarter or so. This is useful particularly as the business scales and its complexity blooms. Writing this list has a few benefits. As Dr. Art Markman, a PhD in Psychology, articulates, lists like these help teams prioritize and convert intangible goals into concrete work. In addition, they delineate the key priorities of the company explicitly. 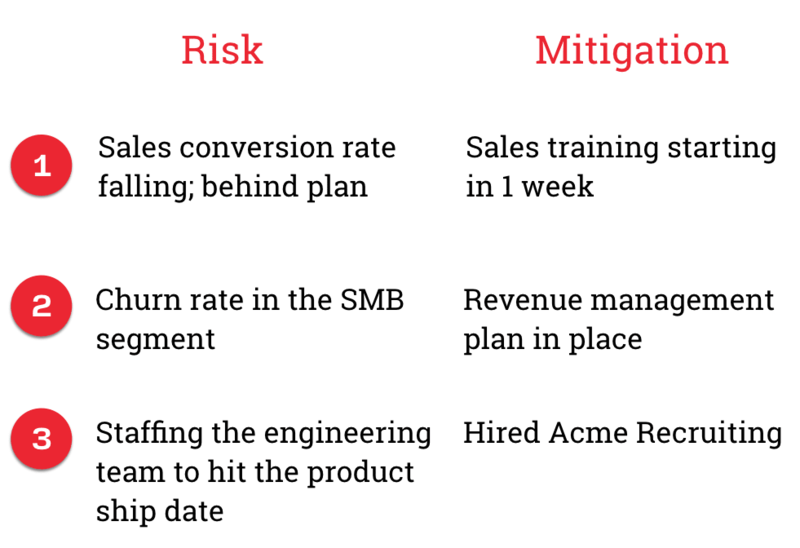 With the startup risk bundle written down, management teams can focus strategic conversations begin on whether the listed risks are the correct ones and whether the mitigating efforts will be fruitful. In this way, the team can be maximally effective.